There is a lot going on in my crochet design studio lately. I am very pleased to announce that a recent crochet book proposal has been accepted by the publisher I submitted to! It is very exciting but unfortunately I can’t tell you too much about it yet. Even though I can’t let you know what the crochet book is about, I can assure you that it is one that will appeal to ALL crocheters and is even appropriate for beginners! As it gets closer to the time of submission and publication, I hope to be able to talk about some of the work I have been doing, as well as perhaps post some sneak previews! Time will tell. In the meantime, the first thing I am trying to do is map out my workload over the next 6 months, so I will be sure to get everything done in time. 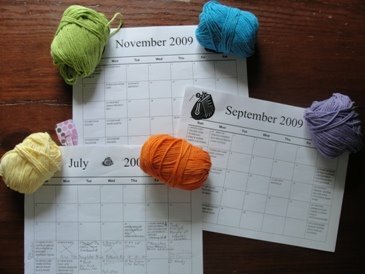 post about time management regarding her crochet designs, I have begun breaking the projects required into days and weeks on my calendar. I am planning a project a week in order to be completed on time. It can be rather daunting to think about all that I have to do, but breaking it all down into manageable tasks makes it seem so much more do-able! Stay tuned for more in the future on my new venture! 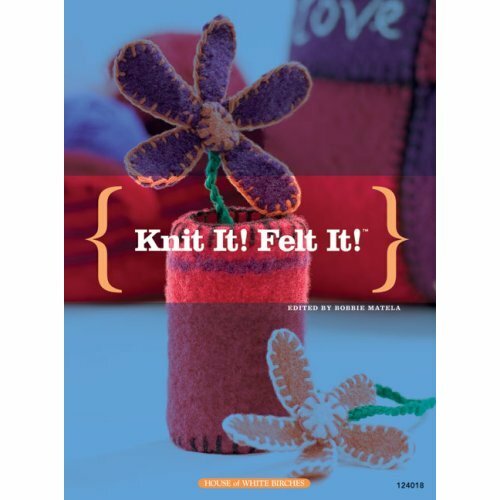 Contest Winner of "Knit It Felt It" Book! Congratulation to Dulcy, of Alabama, who was randomly chosen as the WINNER of our first ever, First Friday Freebie contest! Dulcy is working on her very first felted project, so we hope the felting book will be inspirational for her! Thank you so very much to all who commented and participated. Stay tuned for our next First Friday Freebie contest on August 7, 2009! We are starting a brand new feature at Cute Crochet Chat called First Friday Freebie. On the First Friday of each month, we will be posting a different prize giveaway: crochet patterns, knit and crochet books and crochet related items! The contest will be open for 2 weeks following the day it is posted. Each month, you will be given a set of instructions to follow (usually commenting) in order to be eligible to receive the prize. In honor of our first giveaway, because I just adore the felting/fulling technique, the winner will receive the book Knit It, Felt It published by DRG. The book has 176 pages and contains over 60 projects! So, what do you have to do to win the book, Knit It, Felt It? Leave a comment on this post and tell us if you have ever done a crochet or knit felted project before and what it was. Please feel free to tell us all about your projects! For this first contest, our winner will be chosen from a random drawing on July 17, 2009. CONTEST NOW CLOSED. WINNER WILL BE ANNOUNCED SHORTLY. Thank you so everyone who participated!